While all of these symptoms and considerations are difficult, there’s another side effect associated with chemotherapy that’s related to our work at RHRLI, and that’s the hair loss associated with cancer treatment. 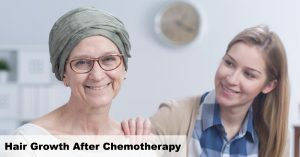 We see all types of patients at RHRLI and we know that those undergoing chemotherapy have concerns about losing hair or seeing thinning hair as a result of their treatment, so we want to give you the facts about the relationship between hair and chemotherapy and tell you about hair growth following your cancer treatment. Not every patient who undergoes chemotherapy treatment loses their hair. According to ACS, It’s hard to predict which patients will be affected. The hair loss occurs when chemotherapy drugs damage hair follicles. Hair loss can occur all over the body, not just on the scalp, although some drugs do only cause the loss of hair on your head. But you can lose your eyebrows, eyelashes, arm and leg hair and body hair. In most cases, hair does grow back, usually within 4 to 6 months. Hair is likely to be softer at first and could grow back with a different color, or it can even come in curly. Permanent hair loss is rare, but it does happen. For example, in recent months, several patients who took a breast cancer drug are suing it’s manufacturer for failing to warn until 2015 that the drug can cause permanent hair loss in some patients, according to KWTV in Oklahoma City. The drug company blames the Food and Drug Administration saying they were responsible for delays in issuing a warning. Those coping with hair loss during chemotherapy often consider covering their heads or wearing wigs. Some people like to cut their hair short prior to chemotherapy, so hair loss won’t be quite so shocking. Some patients wear hair nets or place a towel over a pillow to catch hair that might be shed overnight. It’s also a good idea to buy a drain catch after undergoing chemotherapy. If you’re concerned about how your cancer treatment may affect your hair RHRLI is happy to answer your questions. And if you’re looking for a permanent solution to hair loss or thinning hair, we can help. RHRLI is the only hair loss treatment center on Long Island that offers the ARTAS® System, a hair transplant procedure which uses cutting edge robotic technology to give you a healthy head of hair. Contact us to learn more.